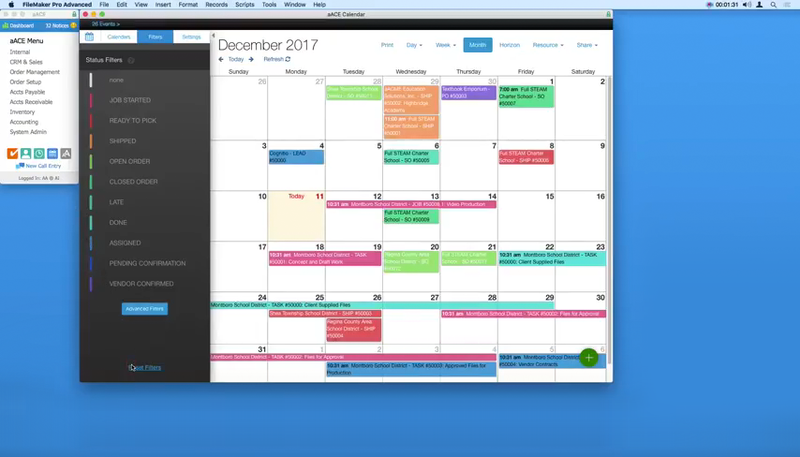 The aACE+ DayBack calendar combines aACE’s powerful business management software for Mac and PC with Seedcode’s fully integrated, drag ‘n’ drop, DayBack calendar. The result is seamless scheduling that lets you manage company resources, stay on top of deadlines, keep apprised of each department's activities, and more. Now that you’ve seen what the aACE+ DayBack calendar has to offer, let’s walk through just some of the ways our fictitious company, aACME Education Solutions, uses it in their daily operations. Shipping Manager Drew Sanderson runs a tight ship. With hundreds of orders coming in each day and a limited pool of resources with which to fulfill them, he needs to be able to plan down to the hour which shipments are going out on which trucks and when. With aACE+ DayBack, he can do exactly that – all from within his calendar. When Drew opens his calendar, he can easily view which shipments have a status of “Ready to Pick” thanks to the calendar’s color-coding and filtering options. To schedule an upcoming day’s shipments, Drew just needs to click on that day, select “View Day,” then navigate to the Resource list in the top menu bar. A table appears with columns for each of the trucks he has available, along with rows representing time-slots in 15-minute increments. To plan each truck’s route, Drew simply drags shipments from the top-left corner of the table and places them on the right truck at the right time. But what if a shipment needs to be rescheduled? aACE+ DayBack makes that easy too. Drew can simply drag and drop the shipment to its new date from within the calendar’s Month or Week view. Now when Drew clicks on that shipment, he’ll see that the shipment record has automatically updated with the new date, and the record log will show that the change was made via the calendar for full visibility. Over in the Sales department, Account Manager Mara Harvey receives a call from Sam Patel, the Assistant Superintendent at the Montboro School District. Sam wants to place an order for astronomy workshops to be held in April at each of the district’s four elementary schools. To schedule this order and confirm a date with the customer, Mara first needs to know what the Workshop team’s schedule looks like for that month. Using the calendar’s advanced filters, Mara is able to view events associated with Kristie Hernandez, the Workshop team’s Project Manager. She can see from Kristie’s schedule that the Workshop team is booked to capacity on the first week of April, but that they have ample slots available on the second and third weeks of that month. Sam chooses dates for each of the four workshops; when Mara opens the order, these appointments appear on Kristie’s calendar in real time, giving the Workshop team plenty of time to plan ahead. To learn how a real-life company uses the aACE+ DayBack calendar, check out our success story on Gable. And if you’d like to know more about this feature or discuss what else aACE can do for you, contact us today to learn more.